I’ll admit it. I like stuff. Cars, clothes, techie things. I’ll admit, I always want more. And, looking around the world, most folks of the 7.4 billion people on the planet would consider me wealthy as a middle class American. If I’m not constantly pro-active in monitoring my attitude and my soul, I can become consumed with my own wealth, or even at times, my perceived lack of it. To even write these words seems crazy, but I suspect it’s a reality for many of us who call ourselves followers of Jesus and live in the United States. Today’s scripture verse from Luke 12, comes after a parable that Jesus tells about a greedy rich man who dies. The point? All of his wealth didn’t save him, and it actually insulated him from others, as his riches provided security and allowed him to not depend on others. His blessing became his curse. As my kids are about to start back to school next week, I reminded of stark contrast between my faith and our culture. The contrast is in the answer to this question: Why do we go to school in the first place? Cultural Perspective: To get an education, to get a job, to get wealth, so we can provide for ourselves and our families. Or put another way, to obtain “security” and “success”. Christian Perspective: To get an education, to help us become the women and men God created us to be, so we can most fully use the gifts and skills God has given us, to make God’s Kingdom, the world, a better place, not only for our selves, but for everyone else. Or to put is succinctly, to be the best I can be to be a blessing for others. Jesus warns us that our wealth, which is supposed to be a blessing, can become our curse. Prayer: Lord, help me to see my wealth as a blessing. May it be the blessing that helps me help others instead of becoming a curse that provides a false sense of security for me. Amen. It’s easy, being such a small part of ginormous universe, to feel insignificant. As one of about 7.4 billion people currently living on planet Earth, it’s hard not to feel inconsequential some days. Today’s verse from Luke 12, Jesus’ words remind us that God views us very differently. You may seem meaningless to others feel as if your contribution to society doesn’t matter, but The Lord sees it otherwise. You matter to God. Let that sink in. Read it again. You matter to God. To God, your worth it. Worth Jesus coming to live among us and die for us. God knows you and loves you, even if you feel like your life doesn’t matter much. I think we all need to be reminded from time to time, that to God, you’re worth it, worth everything. Prayer: Lord, it’s almost incomprehensible that I matter to you, but you say that I do. your love, shown through Jesus, is the proof. Today, I take comfort and solace and find motivation and strength from knowing this, that to you, I’m worth it. Amen. I hope I live my life is such a way that makes my parents proud. It’s not my goal, but I hope they are pleased with the life I have lived. I think on some level we all long for parental approval. Jesus could have responded with a simple, “Thanks!”, but that’s not what he does. We live in a world where we feel like we have to please so many people. I think the invitation and challenge from this exchange, between the complimenting woman and teaching Jesus, comes down to this: Who am I trying to please today? What does God want me to do today? It’s not about a simplistic moral code, instead, transformed by God’s grace, it’s a way of life. Prayer: Lord, set me free from the prison of trying to please people. Instead, teach me your ways of love and grace and sacrifice, for that will be more than enough. Amen. I can get easily distracted. I get distracted by things going on around me. I get distracted by my own busyness. I get distracted by work. I get distracted by helping others. I can get distracted in the details. We all have our distractions. In the short section in Luke 11, especially vs. 34, Jesus is reminding us to stay focused on what’s important. We are distracted by bad things, but I’m guessing your like me, and most of my distractions are good things in and of themselves, except that they take away my focus. Some folks in Jesus day missed that fact that he was right there among them. I wonder how many times we miss God’s presence because we are distracted. The eye keeps the focus. That’s what Jesus is talking about. Is your eye on the beautiful sunset, or focused on the one who created beautiful sunsets. That’s the difference. When we miss the light (Jesus, the Light of the World), the rest becomes dark. Today this passage convicts me to keep my focus on Jesus, then to go and love like Jesus, spread grace like Jesus, serve like Jesus, but all with my eyes on Jesus. Prayer: Lord, fix my eyes on you, and the rest will fall into place. Amen. I have two children. I wish I had a dollar for each time they accused my wife and I of being unfair. I get it. I grew up with two older brothers, so I understand from my kids perspective how life seems unfair. Well, yes, it is. While we want things to be fair, from our ego-centric perspective, life is rarely if ever fair. And isn’t that Martha’s plea to Jesus in Luke 10: 40? I’m doing all the work. It’s not fair. In the midst of her busyness and business and hard work, life seems unfair. Like he does frequently, Jesus uses this as a teaching moment. He turns her argument about fairness in a completely different direction. He points to the bigger picture and the window of opportunity to sit at Jesus feet and learn about God, life, and love. It’s not a question of fairness. It’s a question of time. Do you know what time it is? Time to work or time to learn? Time to do or time to be? Time for business or time for play? Time to get to it and get things done or time to rest and relax? Mary knew what time it was. Martha almost missed it. Do you know what time it is? Prayer: Lord, help me know what time it is. Is it time to work, time to learn, time to play, time to serve, or time to rest? Amen. Many of us do not live in the same places where we grew up. Most folks will have more than one job, more than one career path, and live in mutiple places because of it. When we move, we may stay in touch with a few folks from the places we lived, but for the most part we move on with our lives as well. While this is all part of life’s journey, wouldn’t it be great to see the results of our labors? I wonder sometimes if my life has made a difference in the lives of others. Thanks to social media, I know, that in some instances, my labor has has not been in vain, but in most cases, I have no idea. I simply have to trust that God will use that work to help others. I simply have to trust that God will use that work to help others. In today’s passage we see Moses and the Isrealites on the brink of entering the Promised Land. Here’s the catch, Moses is not going with them. Joshua is. Joshua will now lead the people of God. God used Moses to bring them this far, and now it’s Joshua’s turn, so Moses hands over the keys to let Joshua drive. And this is the way God works from generation to generation. We may never see the fruits of our labors in full, but we trust that others will. See the beauty? It’s about something bigger than ourselves. Moses understood it, Rev. King knew it, and it’s a great reminder for us all. We’re in this together, and while we may not see the end of the Promised Land together, it where God has been leading us all along. It’s also our reminder that we should always mentoring our replacements. In churchy terms, we call it discipleship – doing what we can to prepare whoever is next up to serve. Prayer: Lord, use me today to help others, and while I may not see the fruit of that service, I trust that you will use it. It’s all part of your bigger picture for your kingdom. Amen. Looking to God for Help vs. Looking to God to be Changed? 5 He also said to them, “Imagine that one of you has a friend and you go to that friend in the middle of the night. Imagine saying, ‘Friend, loan me three loaves of bread 6 because a friend of mine on a journey has arrived and I have nothing to set before him.’ 7 Imagine further that he answers from within the house, ‘Don’t bother me. The door is already locked, and my children and I are in bed. I can’t get up to give you anything.’ 8 I assure you, even if he wouldn’t get up and help because of his friendship, he will get up and give his friend whatever he needs because of his friend’s brashness. 9 And I tell you: Ask and you will receive. Seek and you will find. Knock and the door will be opened to you. 10 Everyone who asks, receives. Whoever seeks, finds. To everyone who knocks, the door is opened. When you go to someones house and knock on the door, what are you usually looking for? Yes, sometimes we go to a neighbors house to borrow something, but most of the time we go to someones house, it’s to see them, to interact with them. It’s the relationship with that friend or neighbor that then changes us. Notice the last verse, what is that God gives? It’s not material help. The Father gives the Holy Spirit, to those who are willing to receive. Why’s that so important? As a disciple of Jesus, I pray a lot. It’s what we are supposed to do. And I pray for many of the same things that most people pray for, help with this and that, healing for sick people, hope for those who are suffering in any way, help in forgiving others, etc…most of these are to help me or someone I know or care about. However, with these words in Luke, God is encouraging us to ask for more than fulfilling our wants and desires. God is encouraging us to ask for the Holy Spirit! Here’s the caveat, the warning, when the Holy Spirit comes, it’s rarely to give me what I want, most of the time it’s to change me, to work on my heart and soul and mind, to change the way I think or how I live or what I believe. Changing any one of those is usually quite painful. and a vessel will come out for the refiner. In other words, you don’t have the best vessel of silver, without the refiner’s fire to remove the dross. Prayer: Lord, I’m knocking, I asking, I’m seeking, and I’m willing. Send your Holy Spirit to mold me and shape me for service in your Kingdom. I want to be the best of what you created me to be. Amen. The busy life. Sound familiar. For the last couple months, I have been so busy, that I haven’t blogged much. It seems there is always on more thing to do. Family commitments, work related stuff, helping neighbors…all of these are good things, except….except, as Jesus points out in the verses above, our busyness and business get in the way of our relationships with God and with each other. My culture respects and expects us to be like Martha – tending to business first. I wonder if I’m not too busy most of the time just taking care of business. Sure, The Lord wants us to be responsible, but even more importantly, God wants us to be in relationship. This is where life is found, in relationship with God and with others. So, my question for you today, do you find yourself in the same boat as me? 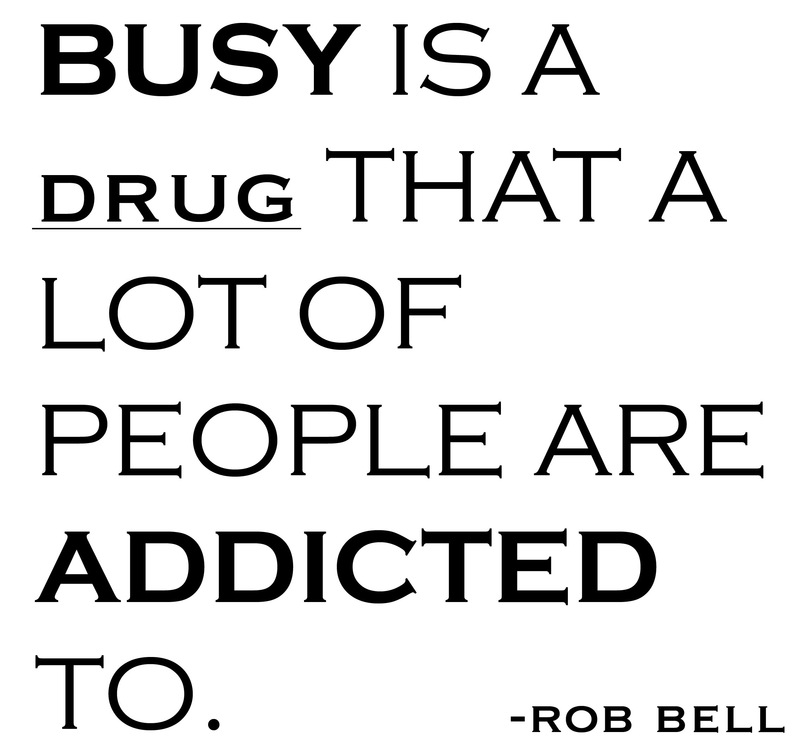 Are you frequently too busy? Here’s your invitation to and challenge to slow down and spend some time with God and with the people you love. Don’t get lost in the good works and lose the relationships. One thing is necessary, and Mary had the wisdom to spend time with Jesus when he was a guest in their house. Prayer: Lord, I’m amazed that you love me and still want to be in relationship with me, but I know that you do. Thank you for waiting for me to get through my busyness, and to realize that all along, you just wanted to be together. Friends spend time together, it’s what we do. My wife and I have two kids, which makes preparing and packing for road trips interesting to say the least, there’s always one more thing to pack that may help us on the journey to our destination, or at the destination when we finally get there. (I still hear the echoes of, “Are we there yet?” and, How much longer?”) Even when we leave the house for school or activity, it seems like we have to go down a list to make sure everyone has everything they need from permission slips and lunchboxes to batbags and cleats. We are encumbered with stuff. I think it’s interesting that when Jesus sends the disciples out, he sends them with the clothes on their back and that’s about it. They have to trust that God will provide. That has me thinking this morning about how much stuff do I really need? How much of this stuff is simply clutter for an already busy life? My family also recently say the remake of the movie The Jungle Book, and they carry forward the song from the original, The Bare Necessities. Alone, in the jungle, how much would you need, and what are the “bare necessities” of life? On a deeper level, as Jesus sends the disciples out, they will have to rely on God working through others to provide. This also has me thinking about how do I provide for the needs of others? How do we provide for our families, our friends, our neighborhood, our communities, and for others throughout the world? Maybe these are good questions to ask ourselves on a regular basis. Prayer: Lord, you have richly blessed me and my family, and for that I am grateful. Help me to see the needs of others and use me as a provision for them. Create in me spirit of generosity. Lead me to a place where my compassion for others is greater then my fear of future security for myself and my family. Show me today where I can help others with the bare necessities of life. Grow my trust in you, that you will provide. You always have and always will. The news is hard to watch these days – Hate crimes, terrorist attacks, racial discrimination in our justice system, snipers taking aim at police officers, floods, fires, and here in Northeast Tennessee, a lone gunman who just seemingly started shooting at random cars driving down the road. These are the days we cry out, Lord, help us from the fear and the anger that has overwhelmed us. That’s where Psalm 83 hits home today. Our enemies and The Enemy seem to have us surrounded. It’s weeks like this one, where I officated at a funeral of a 22 year-old who died in a car accident, that drive us to call on God for help. And yet, I hold out hope, because I trust in the Lord, and I beleive that love wins in the end. Hate, it has caused a lot of problems in this world, but it has yet to solve one. Somtimes I wonder what God is going to do about all this suffering and strife. It’s then that the Lord reminds me that God made us. You and me. We are the solution. When someone speaks ignorant hate against all Muslims out of very real fear, we cannot be silent. When another person of color, especially a young black man get shot, we must remind ourselves that #blacklivesmatter. When police officers are ambushed, we defend those who defend us. Injustice to one is and injustice to us all, whether is down the street or around the world. Who will speak for the Lord? Who will speak love into hate, hope into fear? Here I am. Send me. Will you join me. Prayer: Lord, we pray for those who have suffered injustice this week. Where I have been part of the problem, or to silent for too long, correct me and give me the courage and wisdom to speak to the world with love and hope. Amen.